While searching for ideas for today's post, I came across this video from a couple years ago. We visited the Divine Llama Vineyard for a wine tasting. 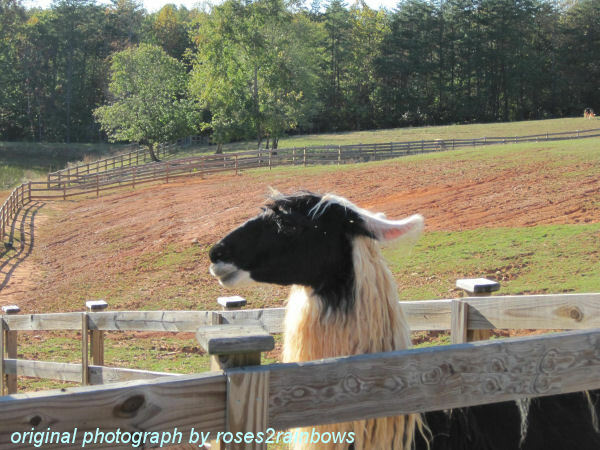 It was a double treat to visit with the resident llamas. You can read more about that here in Wine and Llamas. Here's what they had to say about it. Llama #1: Just once you'd think they would come see us first. Llama #2: Yeah, they beeline to the tasting bar without so much as a glance our way. It's only after they hear about how our llama beans* fertilize the vines that grow the grapes that make the wine that they ignore us for, that we get some appreciation. 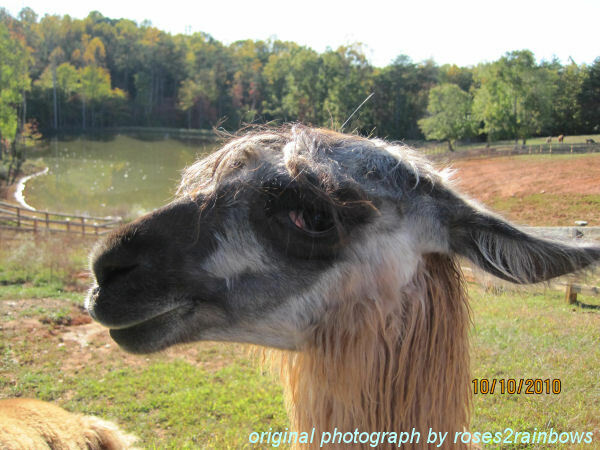 Llama #3: My friends, we don't have to stand for such second class treatment. Follow me! *this is the term the folks at Divine Llama use for llama poop. 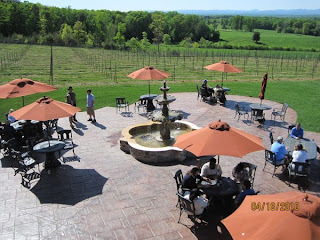 Last Sunday, Kevin and Ashley went wine tasting with us. It was our first visit to the Divine Llama Vineyard, and it was lots of fun. 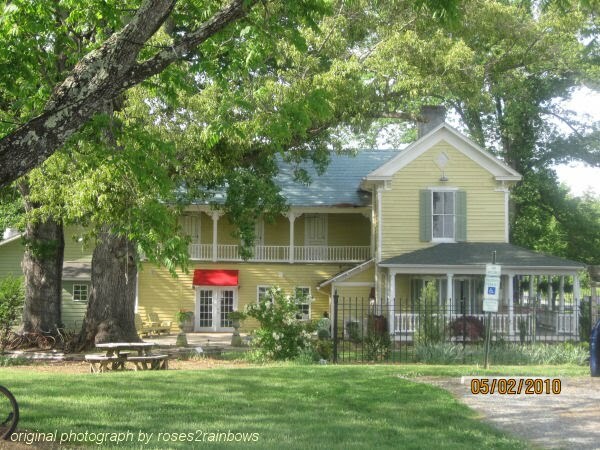 The tasting room is the property's original farmhouse. Before it was restored, it was in such bad condition that the fire department refused to burn it down, so they chose to restore it instead. The place is gorgeous, with a large front porch overlooking the vineyard. 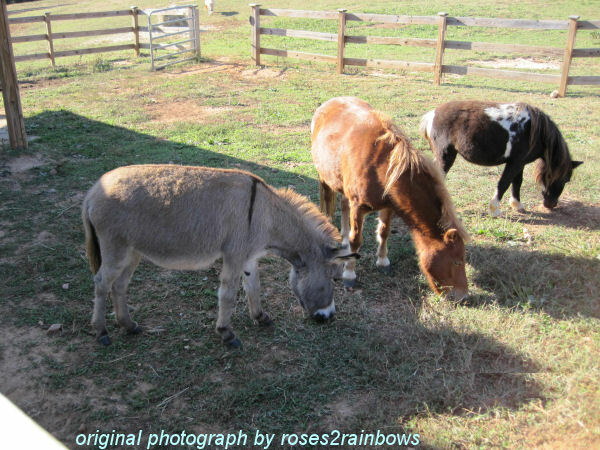 They share the property with llamas, miniature horses, a miniature burro, several dogs, and cats and some 30 chickens. Some of their wines are named after their llamas, who are raised as pets, and show animals only. It truly is a farm, with what looked like several acres of some type of beans out back. From their house, just down the gravel drive, they have a great view of Pilot Mountain from every window. We tasted their array of wines, and they were all very good. The last two in the lineup were slightly sweet, and not so much to my liking, but were still good wines. At Divine Llama, they grow Chardonnay, Chardonel, Traminette, Merlot, and Cabernet Franc. The first three were dry white wines, and my favorites. The wines in North Carolina have come a long ways since we began tasting them five years ago. We noticed as we drove in that there were still grapes hanging on the vines, so I asked if they had completed their harvest. She said they had and the remaining grapes were left for the birds, etc. The reason being that if they used all the grapes they would have more wine than they could bottle and sell before the next harvest. They produce about 12,000 bottles per year. From my taste experience, I would think that soon they should be able to sell all they could bottle. I thought I'd share some of our recent wanderings. This was an afternoon filled with fun, relaxation and beauty. This is the sign for Flint Hill Vineyards. We were out there weekend before last for a tasting. They have some really nice wines, and my favorite is their Viognier. Here is what they say about it: Picked at the height of ripeness. Our Viognier is aged in stainless steel and has the perfect mix of fruit and floral notes. The wine sets itself apart with juicy peach and apricot flavors. 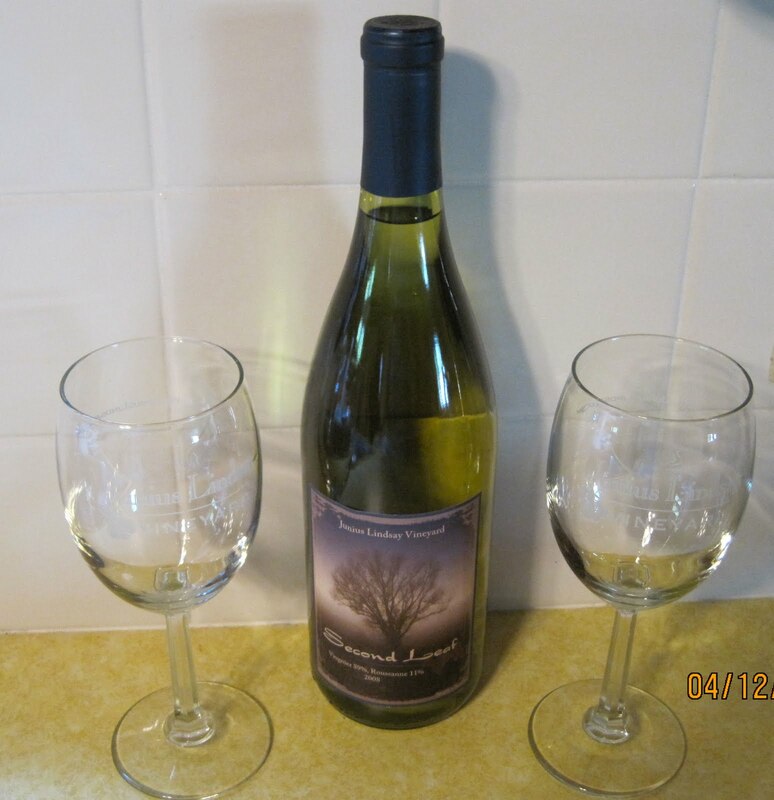 Try this wine chilled with your favorite light dish or on your back deck at evening sunset. This is the family home as it was restored. Much of it, however, is still original. It houses both the tasting room and the Century Kitchen restaurant. You can read more about this here. 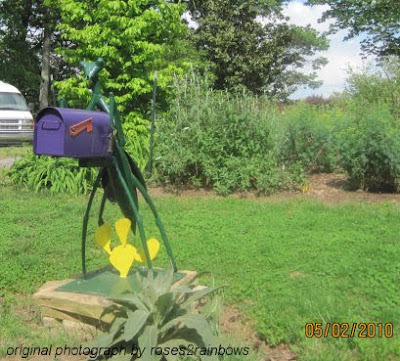 On our round about way to Flint Hill, we came across this interesting mailbox dressed up like a grasshopper. 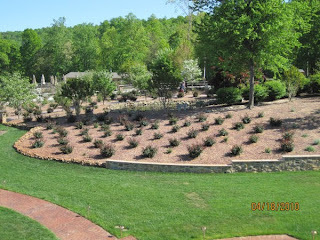 Later that same day we visited Reynolda Gardens to look at the flowers. This is a peony, and a bumble bee going in for a pollen sample. There were many varieties of peonies, some with with big, full flowers like these. 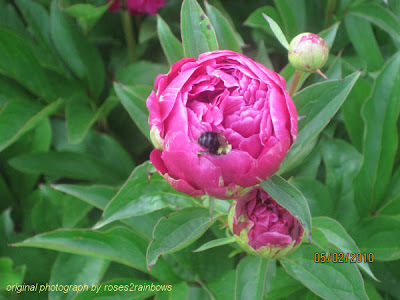 To ones like this with a single layer of petals, and another little bee sampling the goods. It was quite a weekend filled with joy and laughter, old friends and new places. 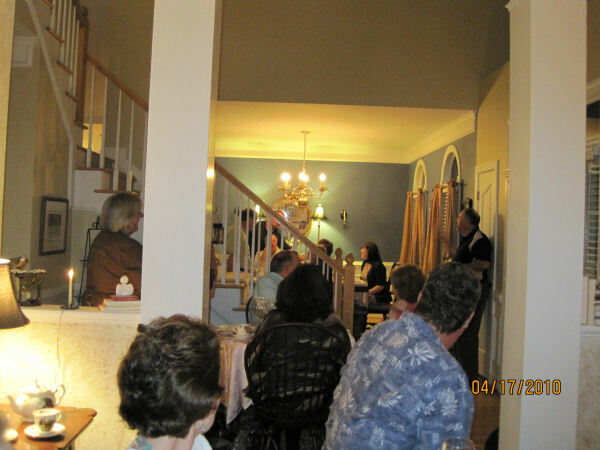 Saturday, was our anniversary, and after going to three stores to chase down cypress mulch, we joined our Cheers friends for another fabulous wine dinner. Dine by Design catered with their usual delicious style. Here was our menu and the accompanying wines. Everything was wonderful, but my favorite dish was the pork loin, and my favorite wine was the Merlot. But the fun didn't stop there. Sunday Kevin and Ashley took us to Raffaldini Vineyards and Winery. It is about an hour north of here on US 421. The view from their Italian-style villa was just amazing. We had a beautiful, clear day with barely a cloud in the sky. A view of the mountains beyond the vineyard. A beautifully landscaped rose garden. On the way to the villa. This was another wonderful day. Since it was getting late and they closed at 5:00, we decided to forego the wine tasting and just enjoyed the nice weather, the scenery and the company. We watched people parachuting in the distance like tiny specks against the bright sky. We did get a couple bottles of their Vermentino. This is a refreshing white wine, delicious with seafood and shellfish and mild cheeses. I look forward to going back and tasting all their wines. Back in town, we wrapped up our day with dinner at Applebee's. Today was quite a treat, and ended too soon. Sharing good times, and good food with good friends was a great way to celebrate our anniversary weekend. A Fine Day for Wine! Isn't it exciting when you discover something new practically in your own back yard? 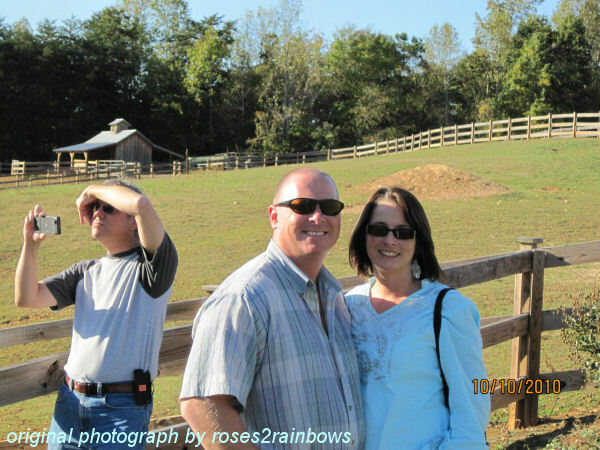 That's how we felt when we visited Junius Linday Vineyards. 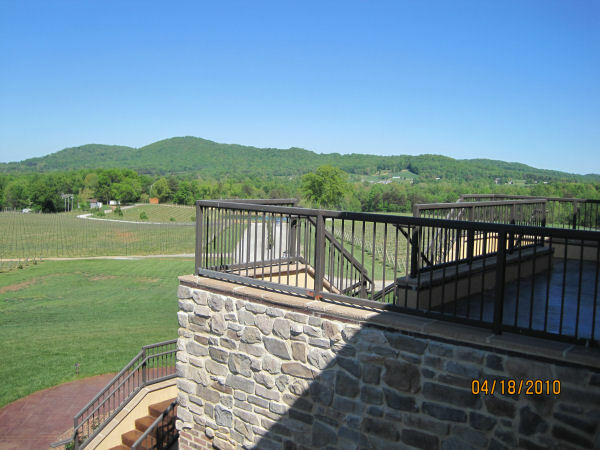 It's located in Northern Davidson County just a short drive from Winston-Salem. Owner, Michael Zimmerman was pouring their wines in a picturesque outdoor setting just feet from the vines. Also part of the team was Bacchus, an American Foxhound named for the Roman god of wine. He was people-friendly, and happily passing the afternoon people watching or lying on the cool floor. 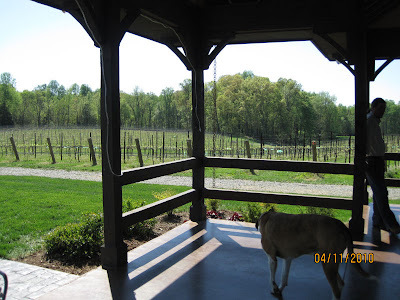 Looking out over the vineyard. There was another group tasting when we arrived, and they bought a bottle to share at one of the patio tables. As we tasted our way through their array of wines (two white, three red and one dessert wine), I was taken with their Second Leaf, a blend of Viognier and Roussanne. 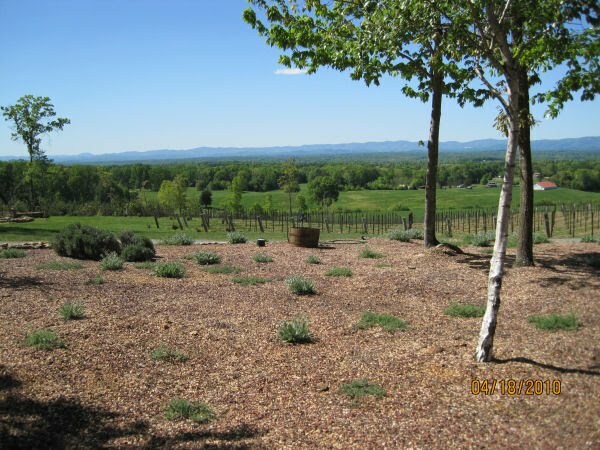 The land, which is now a vineyard, was chosen by Michael's grandfather, Junius Lindsay Zimmerman and his bride Beatrice as they started their life together, and it has been in the family ever since. Michael moved back to the home place with his wife Lucia in 1995 after having spent 15 years in the Foreign Service. In 2004 he began growing grapes on 2 acres, and I believe they are currently planting about 9 acres. This was a great way to spend some leisure time on a nice Spring afternoon. It was a pleasure to meet Michael and learn about their wines and some of the family history. We left with our own bottle of Second Leaf and two complimentary tasting glasses. 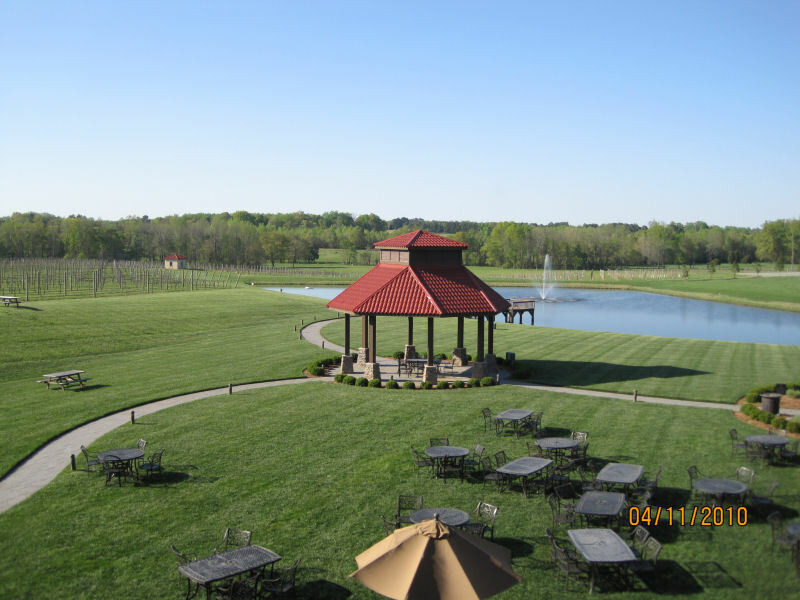 We rounded out the day with a visit to Childress Vineyards, where we purchased a bottle of their Viognier and enjoyed that out on their terrace overlooking a beautiful green lawn and the vineyard beyond. They were out of Trio, our favorite, but it will be available again around the 23rd of April. 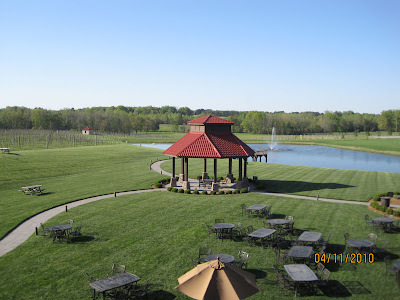 The lawn at Childress Vineyards. Interestingly, both the Junius Lindsay and Childress wines were crafted by Mark Friszolowski, the talented winemaker at Childress Vineyards. Yesterday was no ordinary day. It was another cold, windy day in the sunny South. What made it different from any other day? It was my birthday, a milestone birthday no less. Let the celebration begin. The first birthday-related event was a trip to the New Balance store at Thruway. I had clipped a coupon (ah, here we go again with the coupons) from Friday's paper for 20% off any one item. Wow, just in time for my birthday. I can't pass that up, so we make a surgical strike for the shoes. I walk in and the guy asked how he could help me. "I'd like a pair of 855s in size 7 1/2 please." I tried them on and they fit perfectly, no waffling or struggling with a decision. I'll take 'em. That doesn't happen every day! The main event was dinner at Century Kitchen. 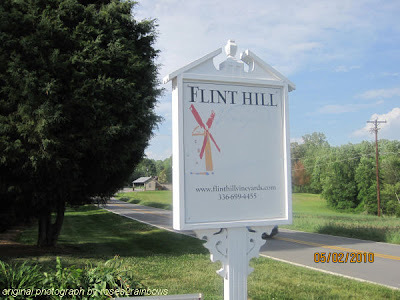 For anyone not familiar with the place, Century Kitchen is located at Flint Hill Vineyards in East Bend. It's out in the country, off the beaten path, and we usually make a wrong turn or miss a turn somewhere along the way. In our defense, it's usually dark when we start out, and this place is way out there. The effort in getting there is worth it, however, and we arrived right on time for our 6:00 reservation - no mistakes. We were immediately seated at a table for two by a floor-to-ceiling window which was original to the house. Pause to explain that the restaurant is in the old family homestead, and though it has been restored, much of it is original, and therefore drafty. I asked if there was another table available, but it was Saturday night, and they were booked. Our waitress, (or do they prefer to be called servers these days?) adjusted our table so that it was at an angle to the window, which moved us somewhat away from the cold air emanating from outside. Whew, now I could concentrate on the task at hand...food. We settled on Duck Confit over Braised Red Cabbage with Chambourcin Beurre Rouge as our appetizer and two glasses of Viognier . Delicious! Yes, the duck and the wine. For my entree, I chose one of the specials of the night, seared Mahi with diced potatoes and thinly sliced Brussels sprouts in a white cream sauce. Hubby got the Pan Seared Jumbo Shrimp and Sea Scallops Crawfish Gumbo and Rice Pilaf. Both dishes were excellently prepared. The chef does not over salt, and shakers are on the tables if you want more. My fish was mildly seasoned and very good. The shrimp and scallops were delicious. The sauce bordered on Étouffée-style, which we don't usually like so much, but this was good, and spicy but not fiery. We were full as usual, so we ordered some dessert to go. It was called a chocolate torte, and described as a flourless chocolate cake with a chocolate ganache. It was a round chocolate cake about 3/4 inch high, covered in ganache and garnished with fresh strawberries, blueberries and whipped cream. It was fine, but next time I'd try something different. On a wine note, since they've been open I've had the opportunity to try all of their wines several times. For such a young vineyard (open since October of 2005), their wines are among my favorite North Carolina wines. My personal favorites are their Viognier, Chardonnay and Cabernet Sauvignon. 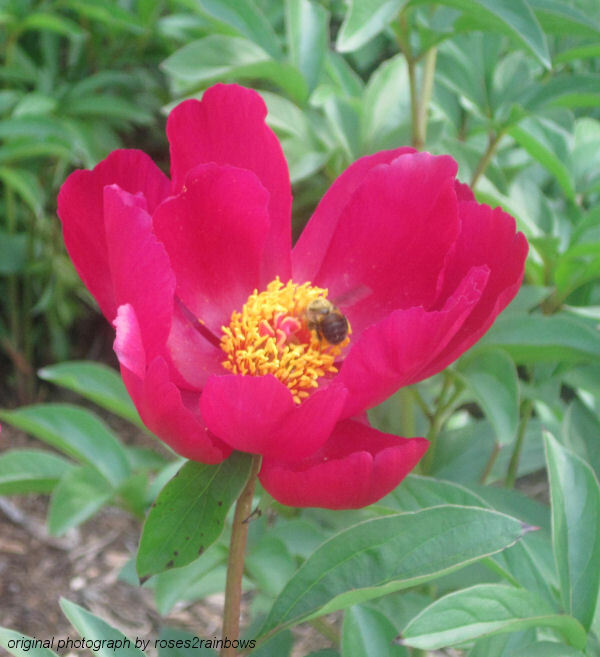 You can read more about their other varieties, as well as the restaurant, on their website. The house is lovely and the setting is picturesque with an old-timey charm. 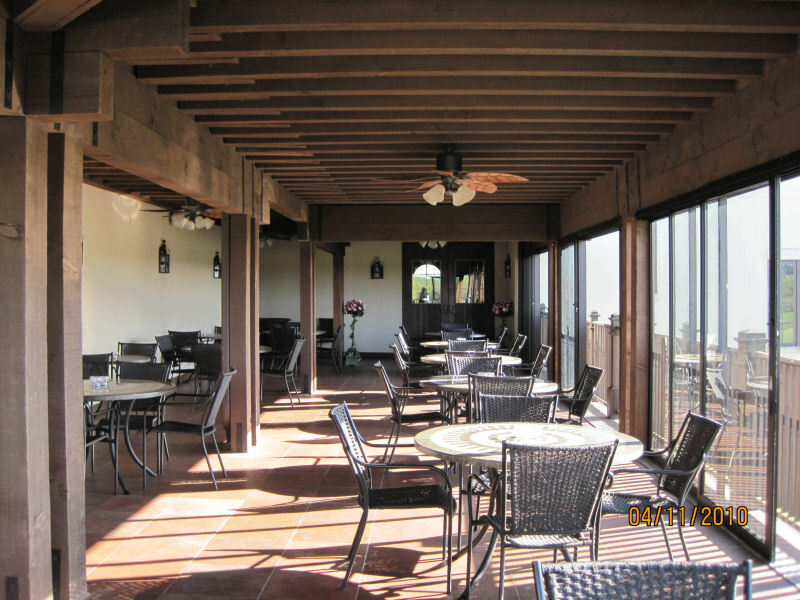 The food, wine and service are excellent, and reservations are recommended. If you'd rather not have a chill with your dinner, you can request to be seated away from the windows. This is another special occasion place that definitely gets a thumbs up rating from me. We belong to an informal group who share a love of wine, good times and good friends. I got an e-mail from the lady who keeps us coordinated and she passed along the following information from another member. He is good friends with the owner of Misty Creek Vineyards, and wanted to share event information in support of this family-owned winery. 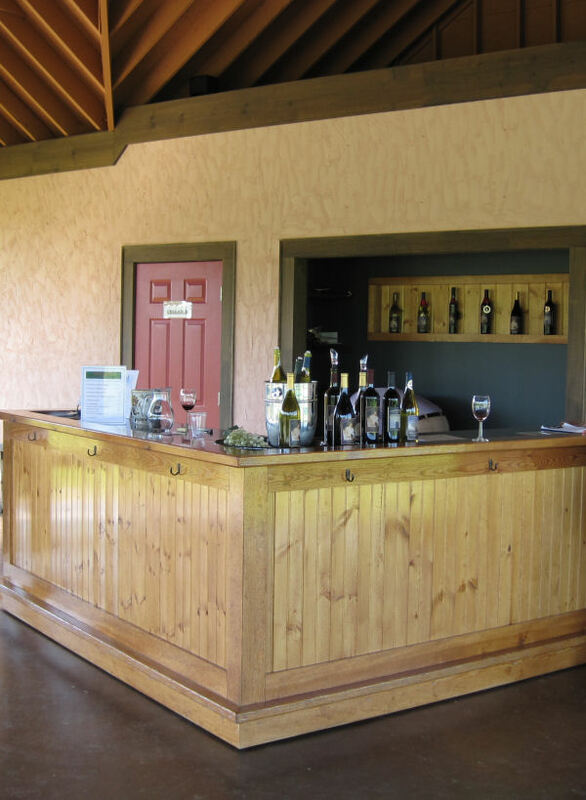 The Nichols family recently opened their tasting room at 710 Wyo Road in Mocksville, and they are having two October events at Misty Creek that may be of interest to you. First, all during the October 16-18th weekend we’re offering a 25% discount on full case purchases, and you can mix vintages to get just the wines you want. Come stock up for the Thanksgiving holidays and enjoy our lodge-style fireplace with snack packs and great wines. The following weekend on Saturday, October 24th the blue grass band Mountain Flat will entertain from 2 to 5 pm here at the tasting room. We’re looking forward to their first appearance with us, and they take requests! Enjoy our cheese and cracker packs, or bring you own snacks or picnic lunch. Hope you can join us. We’ll look forward to seeing you again, and until then, Best Wishes from the Nichols Family! 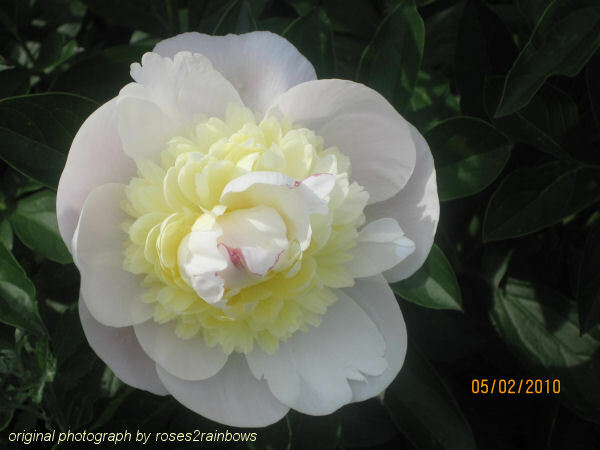 My thanks to Cyndy and Bill for sharing this information. Several weeks ago we had the pleasure of visiting Shelton Vineyards for the first time. It was a pleasant one-hour drive from Winston-Salem through beautiful countryside. We strolled through the shop where they have many wine-related items and, of course, wine. We were ready for lunch, so we didn't take the tour or do a tasting. We ate a very tasty lunch at the Harvest Grill. We chose to eat on the enclosed patio. There were quite a few other patrons there, and everyone seemed to be enjoying themselves immensely. We ordered the crab cakes, which came with grits, corn relish and broiled tomato slices. I passed on the tomatoes, but everything else was delish. This was accompanied by a nicely-chilled bottle of their Chardonnay. Now I don't do WTNs (wine tasting notes), but it had a pleasant nose and went quite well with the crab cakes. Dessert was 3 scoops of ice cream in an edible bowl. One blueberry, one port-walnut and one peanut butter. I tasted all three, but the port was my favorite. After lunch, we took a leisurely walk around the lake. 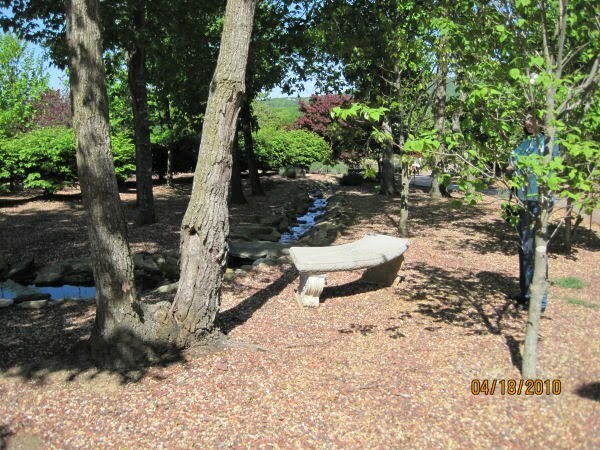 They have picnic tables so you can bring your own fare, buy a bottle of wine and just enjoy the scenery. That day, they were having free hayrides through the vineyard. This is a place to visit again!